From the north: travel through Tanunda, down through the cutting under the arch and take the first road off to your left - Bethany Road. After 1.8kms you will cross a railway line and we are the first driveway (dirt) on your right. If you go passed the church you have gone too far. From the south(Adelaide and Gawler): Follow the Barossa Valley Hwy into the township of Tanunda. Take the first road on the right -Bethany Road. After 1.8kms you will cross a railway line and we are the first driveway (dirt) on your right. If you go passed the church you have gone too far. From north west (Perth): Travel along Sturt Hwy until the intersection of Gomersal Road. 10 minutes on this will bring you to a T intersection. Turn right and in 150metres turn left into Bethany Road. After 1.8kms you will cross a railway line and we are the first driveway (dirt) on your right. If you go passed the church you have gone too far. From south east (Melbourne): Travel via Mt Pleasant to Angaston through to Tanunda. Travel south through Tanunda down through the cutting under the arch and take the first road off to your left - Bethany Road. After 1.8kms you will cross a railway line and we are the first driveway (dirt) on your right. If you go passed the church you have gone too far. If all else fails, I am happy for you to ring me for directions. Enjoy the Barossa experience at our stone cottages overlooking vineyards. 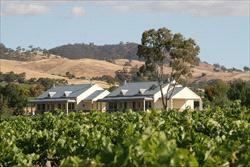 Come and enjoy a truly Barossa Experience by staying at Barossa Vineyard Cottages. These are newly built, fully self-contained stone cottages located in the heart of the Barossa Valley. There are four cottages, surrounded by vineyards with an outlook to the Barossa Ranges and to the spires of Tanunda. Situated in Bethany, the first settlement in the Valley, the area is steeped in history and boasts of great walks as well as being surrounded by award winning wineries and restaurants. The cottages were built in the style of the early settlers with local stone and rendered walls. The high ceilings inside and the modern comforts ensure they are warm in winter and remain cool throughout summer. The cottages have front and rear private verandahs so you can relax and unwind enjoying the wonderful views of the Barossa Ranges, the spires of Tanunda (three kilometres away) of the sunsets that the Barossa is known for. It is especially ideal for romantic getaways. Cancellations made 30 days or more prior to the arrival date will incur a $50 cancellation fee. This fee however may be used towards rebooking at a future date. Cancellations made less than 30 days prior to the arrival date will forfeit the deposit/monies paid. If you do not arrive and/or stay for the entire number of nights that have been booked no refund will be given. Note - there are no sofa beds / roll-away beds available in any of the cottages. We recommend the purchase of travel insurance to cover for unexpected situations requiring cancellation of bookings. We understand that accidents happen but any wilful damage will be charged to the clients account.